The song thrush, part of the thrush bird family, is a popular garden songbird commonly seen in gardens all across the country. Discover all there is to know about this beautiful songbird in our complete guide, including how to identify a song thrush and what you can feed them. The Song thrush has a length of approximately 23cm and a wingspan between 33-36cm. In the UK, there are over 1.2 million Song Thrushes living in our woodland as well as urban and suburban areas. Song thrushes tend to return to the same wintering areas, but the female might have a separate wintering area until the breeding season comes around. Song thrush identification: what do they look like? A song thrush can often be identified by its dark brown/orange colour, black beak and brown/pink legs. Although similar in appearance to the mistle thrush and redwing, the song thrush is actually much smaller than the Mistle Thrush and has smaller, spotted markings along with darker feathers. It’s difficult to tell the difference between a male and female song thrush due to their almost identical appearance. What does a song thrush sound like? A song thrush singing has a distinctive sound that you will most likely recognise from your garden or local park. Take a look at the video below to hear its impressive song. Song thrush food: what do they eat? The song thrush is omnivorous, meaning they eat a range of invertebrates such as earthworms and snails. However, they will also eat soft fruit and berries where available. During the winter months, when food is more sparsely available, land snails are very important for the survival of the song thrush. If you’d like to attract song thrushes into your garden, or perhaps you’re taking part in a little birdwatching, you can grab some of their favourite bird food such as our live mealworms and waxworms. A song thrush in your garden might even be spotted on your bird seed feeder, tucking into the likes of sunflower seeds, particularly during the colder months. Song thrush habitat: where can you find them? Song thrushes can be spotted in the countryside, woodland, parks and gardens across the UK. If an urban or suburban area has trees, it’s likely that you will find song thrushes nesting there, too. They are intelligent birds that will travel wherever there is a food source. The song thrush is common throughout most of Europe, but not in southern parts of Italy or Greece. This common bird has even spread to parts of Russia and Siberia. 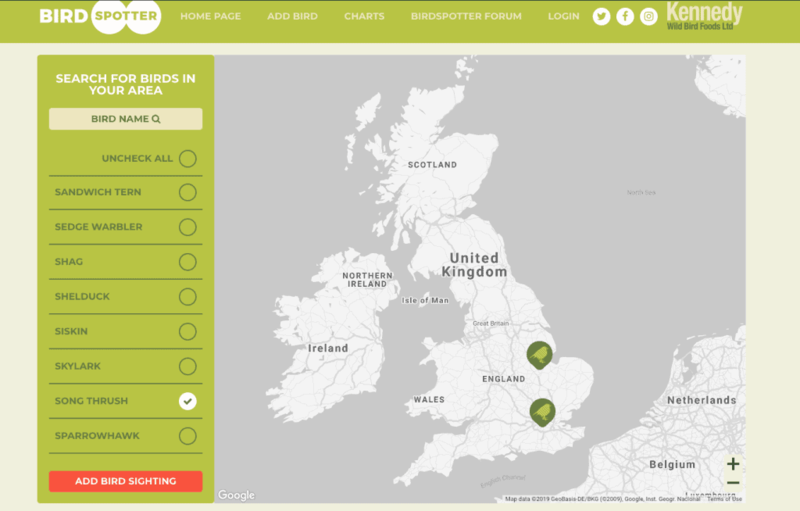 Don’t forget, you can log any song thrush sightings on our Birdspotter app!